S/Sgt David Miller came down dead in his parachute with his legs blown off. Crewmen reported that some of the nine attacking German aircraft had fired at the descending men in parachutes. Lt Martin L. Clark was hospitalized when the Lt Monahan Crew was shot down. Flew as CoPilot for five crews that were shot down. 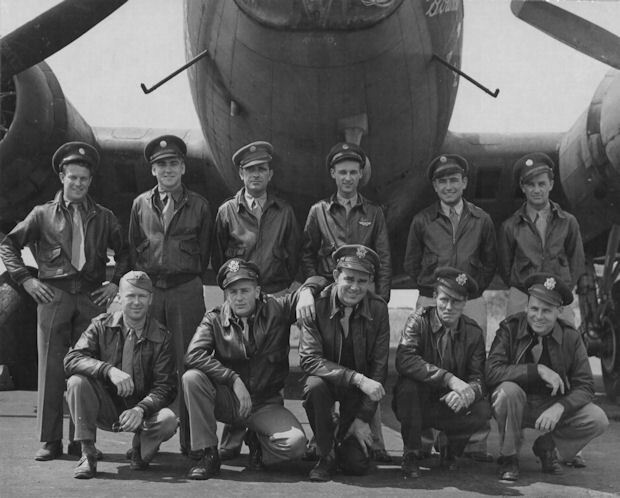 Upgraded from CoPilot to Pilot on 26 Oct 43 and completed his 25 mission combat tour. No crewmen was wounded or MIA on his missions. Lt Ripley W. Joy was originally the CoPilot on the Capt Irl E. Baldwin Crew that flew B-17F Hell's Angels from the USA to England. Was upgraded from Co Pilot to Pilot on 04 June 43. Completed his 25 mission tour on 25 July 1943 and returned to the USA. [See 358th Baldwin Crew photo]. 1Lt Ripley W. Joy was killed in an aircraft explosion on October 31, 1943. Serving with the 21st Ferrying Group, he was ferrying a B-24, which stalled and crashed near Fostoria, Ohio. Aslo killed in that crash were 2Lt Harry O Morris, Jr. and Cpl. Erulio F. Angelosanti. 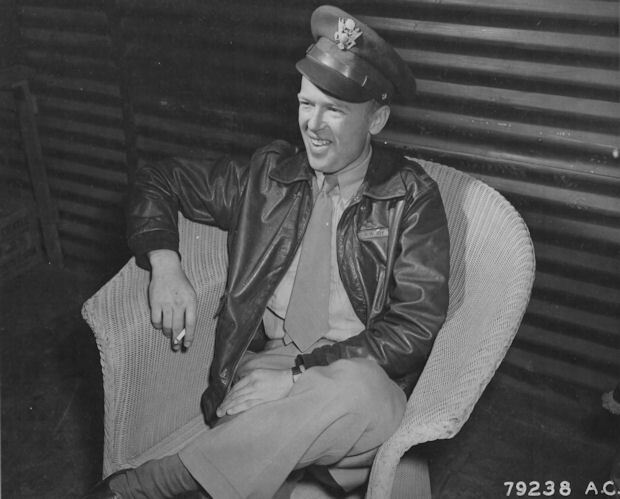 Lt. William P. Maher remained in the USAF after WWII. Was Killed in Service on 18 March 1953 flying in a RB-36H Peacemaker #51-31741, 718th SRS, 28th SRW, on a low-level overwater training flight, just 1,000 ft over the ocean whitecaps, from the Azores to its base at Rapid City, SD. The B-36 became lost in bad weather, had problems with its jet engines and crashed into a frigid wilderness hillside on Random Island, near Burgoyne Cove, Newfoundland. All twenty crewmen aboard were killed, including Capt Maher who was flying as an Observer, Radar Operator. The Senior Officer aboard was BGen Richard E. Ellsworth CG of the 28th SRW. The Rapid City AFB, SD was renamed Ellsworth AFB after BGen Ellsworth by President Eisenhower on 13 June 1953. [See http://www.ellsworth.af.mil/history.html. In September of 2003, William Patrick Maher, Jr. and his wife visited the crash site. S/Sgt Alfred R. Buinicky - Believed to have evaded capture with help of the French Resistance. Later captured and made a POW. See the Buinicky Evasion Story.